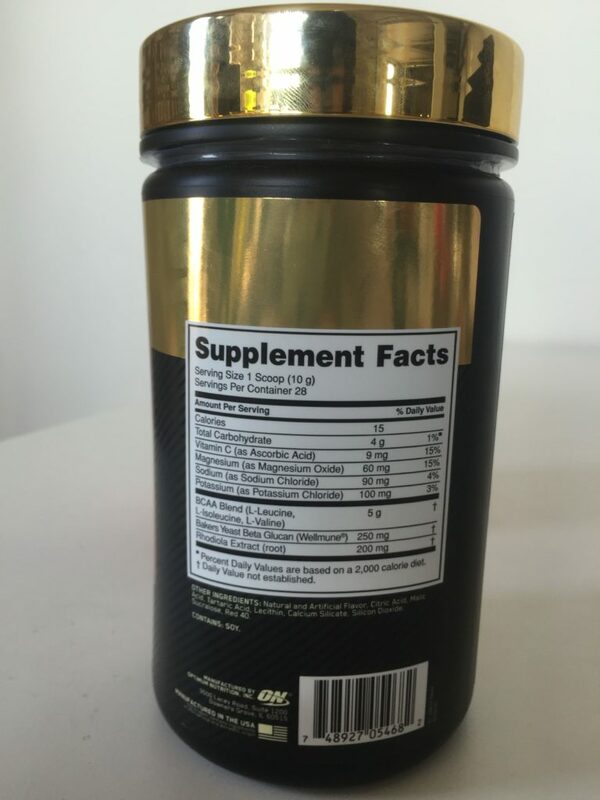 Home » Optimum Nutrition Gold Standard BCAA Review — Does Rhodiola Help? Optimum Nutrition is a large sports nutrition company that’s best known for their whey protein powder, Gold Standard Whey. 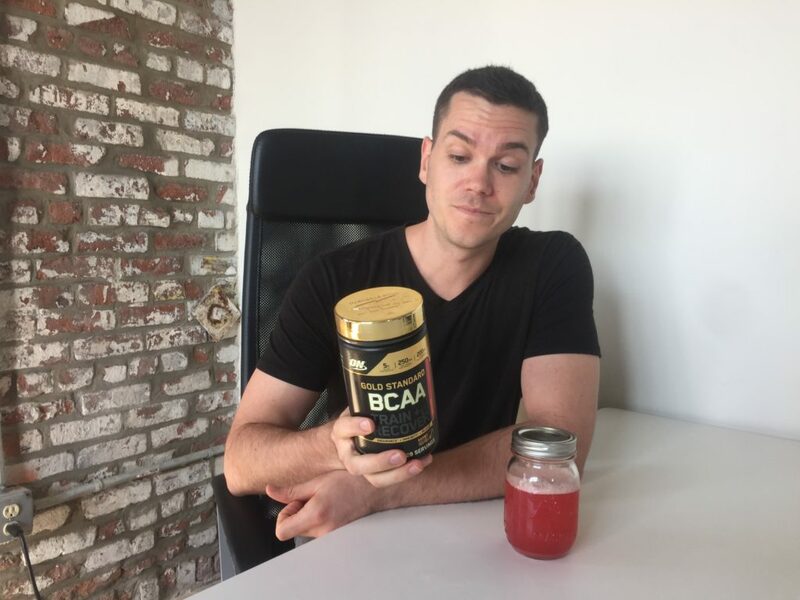 But they sell a huge variety of workout products and while we recently tried out their Amino Energy pre-workout, we wanted to see if their Gold Standard BCAA could possibly measure up to the standards set by their whey protein. What’s really unusual about it is that it focuses not just on improving your workout, but on boosting your immunity so that you can “hit your next workout.” How? One serving contains 15 calories and 4 grams of carbohydrates. There are 5 grams of branch chain amino acids per serving in a 2:1:1 ratio of leucine, isoleucine, and valine. There’s also 15 percent of the RDI of vitamin C and magnesium (as magnesium oxide), and about 100mg each of sodium and potassium (roughly 4 percent of the RDI of each). The most unusual ingredients are rhodiola, an herb used in traditional Chinese and Scandinavian medicine, and Wellmune®, which is beta glucans from baker’s yeast. I’ll discuss their effects in the next section. The other ingredients are just for flavoring (natural and artificial flavor, citric acid, malic acid, tartaric acid, sucralose), anti-caking (calcium silicate, silicon dioxide, soy lecithin), and red food dye number 40. So is this the new Gold Standard for BCAAs? Well, it looks like a pretty solid supplement. It has a solid 2:1:1 ratio of BCAAs, which a few studies suggest may improve muscle protein synthesis, endurance, and focus during workouts. The Wellmune is pretty interesting too. It delivers beta glucans, a type of polysaccharide (which is a type of carbohydrate) that a lot of studies have shown can improve mood and immunity. It’s got especially strong evidence as a way to improve respiratory problems and allergies, but some studies also suggest it can help with colds and flus and other common ailments. Finally, Gold Standard BCAAs is remarkably high in electrolytes. Typically, if they’re included in a BCAA, you’ll probably get one percent or less of the RDI of sodium and potassium, but Gold Standard gives you closer to 4 percent — more potassium than you’ll find in several bottles of Gatorade. One tub provides 28 servings for $30, so $1.07 per serving. That comes out to 21 cents per gram of BCAA, which is almost twice the cost of many popular brands like MusclePharm and Scivation. But in my opinion the rhodiola could make up for the difference. I was less impressed by the taste. It tastes like straight cherry flavored syrup, and it’s pretty intensely sour — I’d recommend mixing it with a good two cups of water. 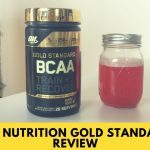 Gold Standard BCAA is an unusual product in that it’s intended to not just help your workout, but also has other ingredients so that you can stay strong for your next workout. It’s strange, but I do believe it’s effective at accomplishing that goal: more focus, endurance, and hydration for the workouts and better immunity so your recovery isn’t compromised. There’s no caffeine, so while the rhodiola is good for attenuating fatigue (some prefer it to caffeine), it won’t amp you up as much as some pre-workouts. But I think that just makes it more versatile — you can probably take it any time, and although rhodiola might not be a good idea late at night, there’s a lot less discomfort from taking a lot of rhodiola than there is from too much caffeine. There is soy and sucralose in this product if that’s a problem for you, but if it isn’t, this may be worth trying out.